Planet X is a massive magnet. The Zetas of ZetaTalk.com explain that the south pole of Planet X is a magnetron intake. In this depiction of Planet X (top image) the real extent of the magnetic lines of force are not shown, they would fill the space between Earth the Sun with their influence. Earth is not shown, but is off-image to the left. 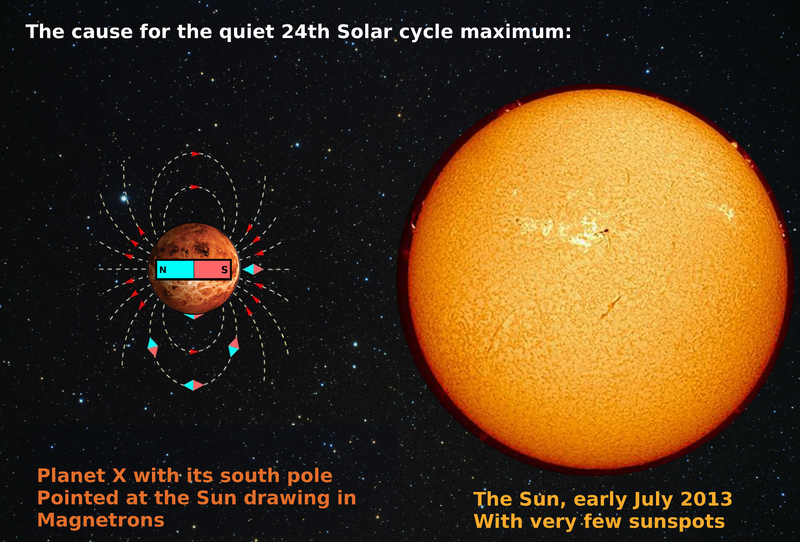 In the case of the disappearing solar cycle maximum numbers 23 and 24, the magnetrons otherwise causing sunspots are being drawn into the south pole of Planet X. The image of the Sun shown here was taken by John Chumack from his backyard in Dayton, Ohio on July 7, 2013. Credit: John Chumack | http://www.galacticimages.com – Artwork by Chris Thomas. When I started research on the Sun’s magnetic poles to do this article, I found nothing but disinformation. I should not have been surprized, however. I also found traces of removed information, which is typical when someone is hiding something. One of the mainstays of the Planet X cover-up maintained by the élite hierarchy is a one hundred percent contrived threat from the Sun, but results from the Ulysses space probe (launched October 6, 1990 to study the Suns magnetic field) challenged this state-approved lie. Quoted from ZetaTalk.com: “In 1995, Ulysses saw strong and simple magnetic fields at both poles of the Sun.” (taken from the JPL website – Jet Propulsion Lab – September 9, 2001). Nancy Lieder of ZetaTalk was one of those few who had noted the results published by JPL at that time, which supported what her Zetas had said all along: that our Sun has defined magnetic poles dominating the solar system. Now, we are certainly aware of the Planet X cover-up, but what has a cover-up of the facts about the Sun’s magnetic poles got to do with Planet X? Plenty, as you will see. First though, I want to focus a little on the timeline-effect of the Planet X cover-up dynamics. I know many people roll their eyes when they hear of government cover-ups or conspiracy theories, but there is a subtle but far-reaching effect that is needing exposure here that may not be taken into account. The internet is rife with disinformation that has become legitimized. Legitimate in the eyes of the gullible, the uninformed or the casual researcher, in part, as some scientific material is published from a secondary or tertiary standpoint. In other words, scientific research assuming the truth of a theory, is therefore innocently forwarded by way of reference. But its science, how is that possible? Here is a quote from David Icke: “Like so much in what we call science, that people take it as fact, it’s actually a theory which repeated it becomes fact.” (transcribed from “The moon is not real“). If you believe something is true without independent observation and research, your mind will seek it out. It is also called projection, everybody is susceptible. Scientists are people too, besides, why would they doubt their peers that work for the U.N., the I.P.C.C., the W.M.O.? Lets also consider, that if a scientist opposes government or corporate-sponsored opinions, you can be sure that their professional life will become uncomfortable and for those who support him or her as well. This is common in the world: a threat from your peers if you oppose their established theories and beliefs, which in turn becomes a subconscious force to be reckoned with when those who you work for make veiled threats to cut-off your money supply. Here are some facts about another cherished theory: the U.S. government spends $10.6 million a day and $4 Billion annually on Climate Change research, and for some reason, some scientists do not not question that and those that do are red-flagged. So, all that money spent pursuing a disputed and unproven theory? We know that many scientists believe these officially established opinions, as when reading published material, not one word is offered-up that throws doubt on a theory supported by high level international organizations. By-the-way, I am not speaking here of deliberately seeded lies, just disinformation innocently carried forward by others. sheer mass of ongoing published works that had falsely assumed that the stand-in counterfeit reports had value. But lets not forget that the cover-up is also driven forward by new lies seeded with half-truths and the misleading use of facts. There are many other sources of such gullible extrapolations based on government lies such as related science research on another subject that touches on the false theory, new government programs based on the original lie, but with a new vector. For example, Climate Change (a.k.a. Global Warming Theory) was created as a cover for anticipated earth changes (likely taken from ZetaTalk) once Planet X got close in, as it is now. This is the base lie. Now the “kyoto Accord” or the “Kyoto Protocol” was developed by the United Nations as part of the Climate Change lie, an international treaty to supposedly reduce “greenhouse gas” generated around the globe. (“greenhouse gas” is a misleading moniker used as the main component in the Global Warming Theory lie). Now enters the tertiary effect in the cover-up timeline: “carbon credits”. Now Carbon Credits (one tonne of “greenhouse gas” per) were developed to be a way of dealing and trading against the difficulties of managing “greenhouse gas” or more commonly known as CO² emissions, between countries. From Wikipedia.org: ” Since GHG mitigation projects generate credits, this approach can be used to finance carbon reduction schemes between trading partners and around the world“. So now you see, one lie built on another and another, this is how the cover-up propagates legitimacy. The point in question though is: does the Sun have strong north and south magnetic poles? The Zetas of ZetaTalk say yes, but common thought science on the internet says different. If one searches for information on the Sun’s magnetic poles, all they will find is the current theory that claims that diffuse and/or dipole magnetic fields (both polarities side by side) are emanating dynamically from anywhere on Sun’s surface, even assertions that the Sun will manifest “quad poles”, but the most eccentric bald-faced lie is that the north and south magnetic poles “switch” polarity in concert with the apex of each 11 year solar cycle. It is very odd and perhaps a little scary to find only the official viewpoint of the élite hierarchy on a subject. You would expect (hope?) to find a healthy mix of conflicting opinions and thoughts on a matter, scientists arguing, throwing their hands up in the air and drinking coffee over late night sessions trying to find common ground on the matter, but no, only a single controlled point of view with a slight bloody trail of removed web pages. 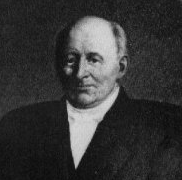 The discovery of the Sun’s Cycle of maximums is attributed to Samuel Schwabe in 1843, this means the Sun’s 11 year solar cycle has been documented for approximately 170 years. Therefore, I think we can assume the truth of the solar cycle. But these other theories just don’t make sense. The reasons for this confusing theory not making sense has many threads. First is that the Zetas have said that the sun has normal north and south magnetic pole activity, and on science points like this, they have excellent accuracy and track record. Second is that if all the other planets in our solar system have defined magnetic poles and all stand within the Sun’s magnetosphere, it stands to reason the Sun does as well. Oh, but the third is the worst science of all these recent lie-theories: the “flipping” of Earth’s magnetic poles. Human science has been aware of the Sun’s magnetic field since the 1600’s and we now know that most the planets in our solar system are magnetic and have various north and south pole orientations obviously under a prevailing magnetic regime. We also know that magnets align themselves within a dominant magnetic field. We also knowthat the Sun’s magnetosphere extends beyond Pluto (Voyager 1 has been traversing our solar system for almost 36 years (as of late July 2013), and has traveled 11.6 billion miles and planetary scientists are still not sure if it’s in interstellar space yet). It’s also reasonable that astronomers of old would have defined the appearance of the poles of the solar system planets and would have reported an “upside down” planet by now. There is no mention of flipping planets in the science books. Regarding the Black ops lie of our Sun being a threat to Earth, I found another amazingly successful cover-up of a kind of evidence you would not expect: the Internet-wide removal of a specific crop circle! But first, allow me to give a quick background on Crop Circles. Without a doubt, ZetaTalk is the only reliable source in the world on the meaning of crop circles. Over the years, the Zetas of ZetaTalk have described the meanings of many crop circles. The theme is always a thoughtful care that the ET circle-makers offer humankind, consequently, all crop circles offer various kinds of assistance to Earth’s population. The language is subjective in nature, which is why ego-cultural-language is not used but a Universal language of symbol instead. The crop circle in question is known as: Woodbridge (July 13, 2004). The Zetas explain that Woodbridge is a reassurance that the Sun is not a nuclear threat to Earth. 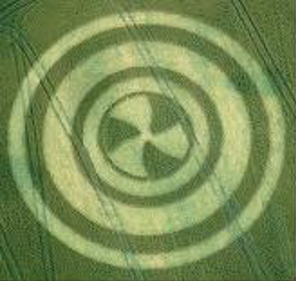 This is revealed first by the nuclear symbol in the center of the crop circle that is surrounded by two other closed circles clearly indicating one hundred percent protection for all planets in our solar system. If a Google search was performed against: “woodbridge crop circle”, the only image of this crop circle will be found on the ZetaTalk web servers. Now if you go to the best reporting source on crop circles: http://www.cropcircleconnector.com and run a search, you cannot find this crop circle, it’s like it didn’t happen! So again, Nancy Lieder has the only evidence of another cover-up. Perhaps any remaining conspiracy theory detractors will believe my earlier assertions, that you cannot find the original Ulysses public statement about the Sun’s poles being consistent and strongly polarized. So you can see why the élite hierarchy wanted this very obvious message of solar protection removed, and they did, INTERNET-WIDE. Sun spot graph for solar maximums 22, 23, and 24 showing the decline in solar maximums. Notice that cycle 24 is not plotted yet, therefore the curve is projected. Some facts about sunspots and the solar cycle. Sunspots are dynamically located regions on the surface of the Sun known to be characterized by concentrated magnetic activity, they appear dark or as “spots” because those regions are approximately 35% cooler than the surrounding surface of the Sun. The increasing frequency and density of sun spot occurrences are part of the formula that planetary scientists use to plot the graph of a solar cycle. The solar cycle has shown to be a wave motion peaking in 11 year cycles or “maximums” since routine study first started in 1843. The current solar cycle is number 24 which was to peak this year (2013), but planetary scientists are stumped, at least many are acting and talking that way, as solar activity is fading from its predicted maximum. I should add that apparently sunspots are a kind of portal for the other solar activity that scientists look for, such as CMEs (Coronal Mass Ejections) and solar flares (invisible but explosive releases of bandwidth-wide electromagnetic radiation). Without sunspots, CMEs and solar flares do not happen and so far this year the maximum is shaping up to be 50% shy of the 2001 maximum (number 23), which in turn was also short by about 30% from the solar cycle number 22 (1990). Now these dropping maximums, especially that of the very low activity of 2013, is very inconvenient for NASA. It throws a wrench into NASA’s nuclear Sun-bomb cover-up mechanics, one that was supposed to obliterate Earth in some kind of a massive super X-class CME. So no mr. cover-up, the Sun is actually sunspot-quiet for its 24th solar maximum. Roswell ET, a.ka. “Skinny Bob”. Additionally and not surprizingly, NASA’s cover-up team is moving the dates around: “Left with egg on their faces for all their wrong predictions, NASA scientists are now trying to re-write history. 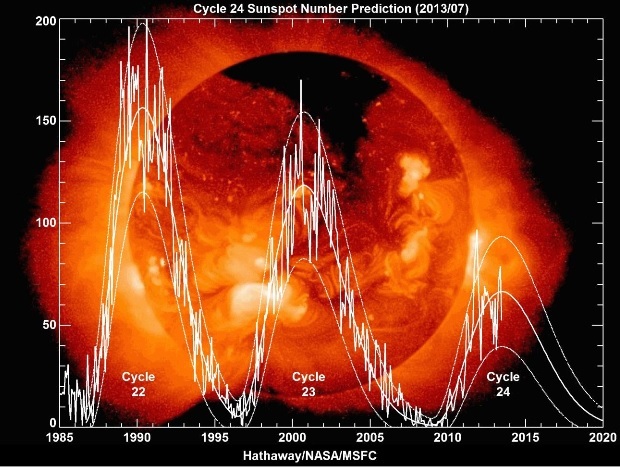 The solar maximum for cycle 24 was originally projected for 2010-2011. Then it was extended to 2012 to align with the 2012 Mayan Calendar predictions, in part, but also because the solar minimum was showing the Sun to be shockingly quiescent. Sunspots were virtually absent. Now as 2012 is past and the Sun has still not approached the expected maximum, they are pushing the dates once again. They are caught in a web of their own lies.” (quoted from ZetaTalk Chat 03/16/2013). Since the solar cycles maximums have been reliable since about 1950 (the start of the “modern maximums”) , why has 2013, and to some degree 2001 been such duds? Well the Zetas have explained that the south pole of Planet X acts as a magnetron intake and has had its south pole “pointed” at the Sun for some time now. This has been the cause for the quiet sun through these maximums. Now however, the Zetas have said that Planet X has moved. 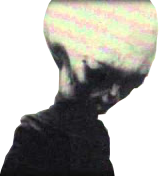 The Zetas: “But the grip Planet X has on the Earth, Venus, and the Dark Twin has been tightening lately, as Planet X is outbound and is closing the gap. Looking at this drama from outer space with the N Pole of Earth topside, one would have seen Planet X slightly to the right with Earth, Venus and the Dark Twin clustered to the left. For reasons too complicated to explain, due to the approach of the April Trimester which arrives on April 20, Planet X is pointing its N Pole more to the left, toward the cluster of planets. This skews Planet X so its S Pole is not pointing directly at the Sun, no longer acting as a direct intake for magnetrons from the Sun. Thus, sunspots are again appearing on the surface of the Sun.” (ZetaTalk Chat ZetaTalk Chat Q&A for 04/16/2011). Since this last ZetaTalk quote was from over 2 years ago, I can only assume a slow-moving Planet X will eventually allow the solar maximums to pick up. We will see, perhaps more interesting events will stump NASA’s planetary scientists. This entry was posted in About Planet X, Climate Change, Exposure of Authorized Deception and tagged chris thomas, climate change, climate change lie, crop circle, crop circles, earthchanges, flipping magnetic poles, global warming, magnetic pole shift, nancy lieder, nasa lies, solar maximum, suns magnetic poles, sunspots, zeta talk, Zetatalk, zetatalk prophesies. Bookmark the permalink. ← On Spiritual Law, Planet X and ZetaTalk. Thanks for your comment Tracy. Well we don’t have to die, this the whole reason I promote the awareness of Planet X, but I take your points gratefully. 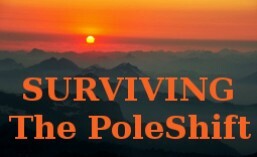 When you break down the impending Pole-Shift to the simplest possible facts, we only have to move uphill and/or inland to initially survive, stay out of the weather during the Pole-Shift and stockpiling food and tools for our new lives. Tracy, it’s the After-Time I am so looking forward to. Hi Chris, Antonia Lau of Onlyonepla.com would disagree with you when you say that we only have to move uphill/and or inland. She is categorical that we will need to be at least 12 feet underground, for 6 months -2 years. Thoughts? Hello Triona, I am so glad you asked this question, as regardless of what anyone believes about Planet X, all will want to survive the pole-shift event. When I said: “we only have to move uphill and/or inland to initially survive, stay out of the weather ” that was a general and off-handed comment and not meant to be my official position and a gross oversimplification to be sure. This subject is a full-on article I have been thinking out sending up for a long time, perhaps one of the most important of all. But for now, I will try to give my best possible response here. 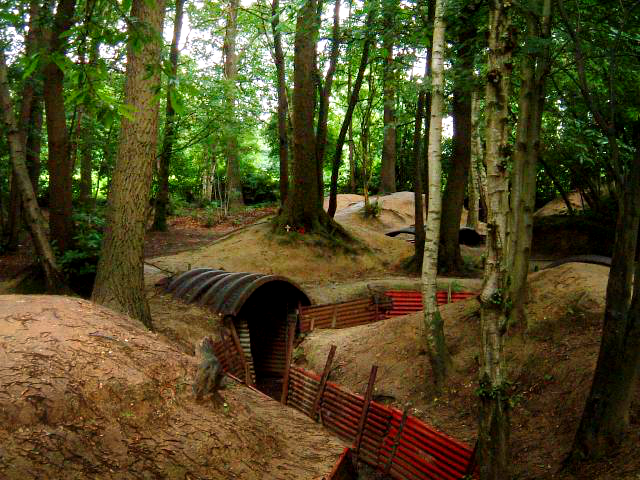 https://survivingthepoleshift.files.wordpress.com/2013/05/poleshift-trench.png ..notice the steel sheeting, probably best to use sand bags for the sides and the steel on top. I had the idea a few years ago to bury a car with several feet of dirt above, but exits would have to be carefully planned. Of course a cave would be another location to consider, but exits again, as soil from the last few thousand years may block leaving. Keep in mind that caves are hundreds of thousands of years old, so have survived many past pole-shifts, yet the cave *may* not have enough drainage and those inside may find themselves and their equipment under water, so check for cave drainage. If a person is situated near mountains like the Sierras or the Rockies, they should consider moving away to older rock areas, the older the better, as older rock is harder and more likely to hold–somewhat. Similarly, the Urals of Russia or the Appalachians of the Eastern U.S. are stable areas that are less likely rock fall your location. If you live near a river, you can’t stay there, it will flood, which brings up the water issue, both salt and fresh. Remember the pole melt within two years in the after-time, so might as well settle in an area that won’t be permanently flooded: aprox. 675 feet above current sea levels. During the pole-shift we have massive deluge of rain, so any trenches will fill with water unless you provide adequate drainage; plan for a large rivlet of rain water streaming through your trench system. Since pole-shift winds are most likely to assume the prevailing wind direction of your area, one *could* plan to hunker down behind a berm, a steep hill or small mountain with* an open trench with a steel sheet covering with *handles* installed underneath for manual hold-down *and* rocks and a layer of dirt on top. Being in the lee of these large masses is excellent protection from sideways flying rock and debris. Your site is also likely to be less cluttered making an exit easier. A steel culvert is another idea for protection, but water drainage is so important to plan for. I don’t like the idea of being “underground”, as the deeper you are, the more danger of the pit being your gravesite. Exits, exits, exits, should always be the motto. I’d like to repeat some engineering advice I’ve had about burying an internally braced shipping container as a bunker. The container should be buried a few feet below the surface, but once the excavation is made, steel I beams of about 30 foot length should be driven as piles at the corners, with the top at ground level. Once the container is in position it should be welded to the posts. Then, place a second container on top of the first and weld that together as well. Once your access has been created, fill in arounf the buried container and also fill the upper container full of the excavated dirt. The idea is that once the high winds and hazards have passed, the top container can be emptied of dirt and used for indoor gardening or storage, etc. Hi Gordon. Certainly if someone has the money, skills and time to set up a safe bunker like that of your engineering advice, it would be good, but a safe bunker doesn’t need to be that expensive or complex. One only needs to dig a trench and cover it with a sheet of corrugated steel, so that’s only $40 or so and a few hours of digging. One should also install several pairs of handles underneath so two men or women can hold down the steel cover to prevent it from flying away in the very high winds. As well, the trench should also be laid out so that it has good drainage for the torrents of rain that will fall; that means a ditch that extends through the center of the trench and well beyond (both sides) so family and goods are not lying in a rushing stream of rainwater during the pole-shift and during the hours of wait time up until the event itself; Also perhaps a raised floor would be preferred to a ditch. Water drainage is one point that the design you posted may not have taken into account; Many survivalists do not think in terms of a pole-shift, but only a war, social unrest/breakdown or a (false) CME sunburst (false). Perhaps in some areas in the world, such as a salt flats or a high stable (old rock) plateau area would do well with a buried steel container or even just a staked-down container on the surface against the winds if situated in a forested area or behind a berm, but not necessarily IN a forest to avoid falling trees. In the case of the latter, one would have to provide the above-ground shelter with protection against falling trees or go with a well-drained below-ground container with adequate escape exits. That brings up a point that needs to be addressed as well, entrance and escape pathways need to be well designed too; deep enough to navigate around fallen trees and debris lying over top of your exit trench; alternate escape avenues/ports/doors may need to be considered, especially if near a forested area. It only takes a little money and a lot of planning, this is my point, so that almost anybody can take advantage of the covered trench. The covered trench plan came originally from zetatalk.com with respect to the pole-shift, otherwise they were extensively used during WWI.